Toybank UK kick-started it's operations in May 2010 with a fantastic event at a school in London. "At recess time in school, bring a toy from your room in return for a sumptuous home-baked Cup Cake! Nada Wynn from the PTA committee at Queen's Gate Junior School in London approached Toybank with this simple idea and we were all for it! The events started off with a few Queen's Gate students making colorful "Toybank - Cup Cake Sale" Posters to be put up in the school. A few weeks later, Toybank's School Presentation was shown to all the children. This presentation is a lot of fun, but has serious bits and many learnings too, it tells the kids where their toys are going and how a toy donation can put a bright smile on another child's face! One day before the event, I visited Nada's place and was excited to see so many colorful cup cakes all ready for the sale. The event on 7th May was a huge success, all in all 327 toys were collected. In addition to a cup cake, each child that brought along a toy was also given a Toybank badge that aptly said 'I'm a Toybanker'. 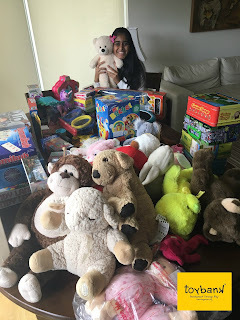 Later Nada's team of 5 parents and 5 children gift wrapped and packed the toys in boxes. 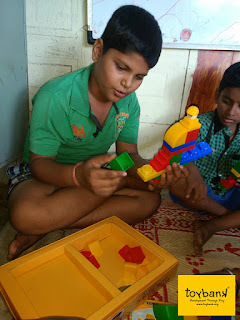 The parents of the children participating at the event, contributed towards transportation and logistics costs, so that all the lovely toys could make their journey from London to Mumbai. All members of the newly formed Toybank UK Committee - Shruthi, Ayushi, Nilam, Praful, Sabrina and Roshan were thrilled with the success and look forward to other such events in the UK! Toybank sincerely thanks all the Children, Teachers, Parents at Queen's Gate Junior School and Nada Wynn in particular for this wonderful event! Toybank also thanks Ivan Rodrigues from DTDC Couriers who provided a prompt service!" "The girls of the Queen's Gate Junior School held a "Cupcake for Toybank" exchange on the 7th of May 2010. The event was a huge success for all the girls who participated. All they had to do was bring in a toy in good condition from their own room to exchange with a delicious cupcake. The girls enjoyed this day and felt very proud to be working along side of Toybank. All the 327 toys where sent on to Toybank in India. We the Committee of 5 parents and 5 girls would like to thank Roshan Bharwani from Toybank London for all her help and support in allowing Queen's Gate School to hold this event in aid of this incredibly important charity." This is a brilliant concept and one that should be copied in schools throughout the UK, it teaches the children so much and helps those less fortunate. Good luck with it I really hope it is something that is picked up by many schools. Thanks so much for your support! Our UK team is working towards creating awareness in many more schools in UK. A good charity work and that too for the school children. More people should come forward to support charity in a great way. It is heartening to hear that a number of millionaires are joing under Bill Gates for this cause.